Rarely does a toy come to market offering extremely balanced creative play and natural learning capability. The WEDGNETiX construction bars come in four different lengths allowing kids to connect and rotate parts into perfect symmetries and outrageous spatial designs. Once you play with WEDGNETiX™ you will quickly appreciate the unique qualities of this product. If you visualize that a WEDGNETiX part can rotate a full 360 degrees off its mating part then you will understand how a child can naturally differentiate from 45-degrees to 90-degrees to 180-degrees. WEDGNETiX ™ unlock a child’s natural learning skills through the hands on interaction of building both 2D & 3D geometries. This multi-dimensional interaction keeps young builders designing for hours on end. Kids actually build their own stacking blocks by linking WEDGNETiX parts to make triangles, squares, rectangles and hexagons. Or, they can create “crazy cool” geometries by looping, bending and criss-crossing their unique designs that will be ready for display at the Met Museum. 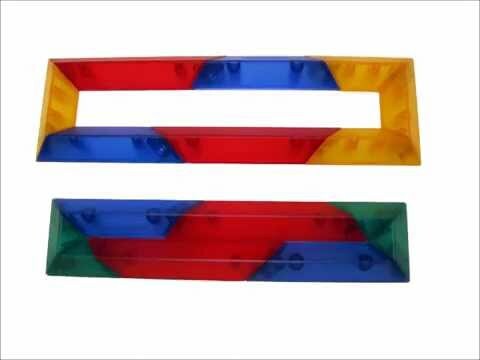 WEDGNETiX™ magnetic construction bars bring a whole new dimension to play-time. Each magnetic plate can rotate 3600 off of a metal connecting dimple from an opposing bar. This fool proof design always assures that the parts will align and connect properly for a “positive” play experience…(pun intended)!! Each construction bar has one embedded magnet so you can create 2D designs that interconnect while laying flat on a table or by creating 3D masterpieces that defy gravity while rising into the air. ImagAbility, (who brought you WEDGiTS™), is offering WEDGNETiX in sixteen (16) piece and thirty-two (32) piece design kits. Kids can construct their own designs, plus, they will find numerous challenges to replicate structures found on a Design Guide inside of every kit. Measures approximately: 10.00 x 2.50 x 7.50 inches..